'Hurricane Michael killed the love of my life': Widow recalls moment tree crashed onto home in Fla.
GRETNA, Fla. — “He started screaming oh my god, oh my god!” Gayle Sweet recalled Thursday as she sobbed in pain while sitting inside of a pickup truck in the driveway of her Gretna, Florida Home. 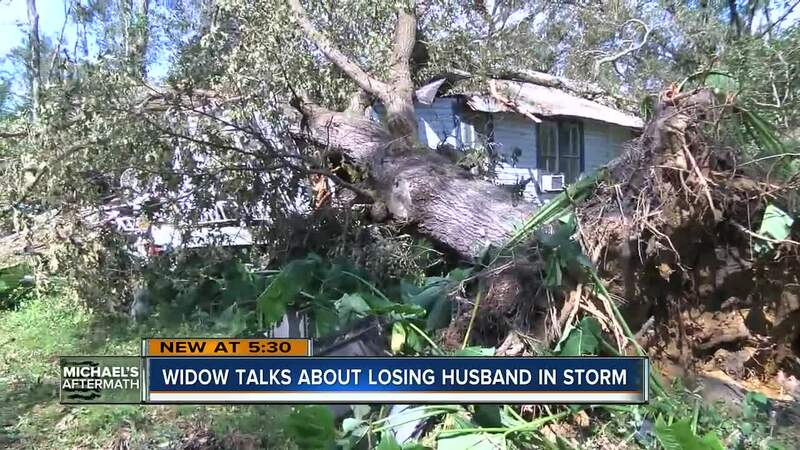 Her husband, Steve, is one of six confirmed fatalities, so far, in the aftermath of Hurricane Michael. Sweet says she and her husband were on the front porch of their mobile home when she heard what sounded like a freight train. Moments later, she says she watched as all the trees around them started leaning to the side. Steve yelled, 'Get inside the house!' she recalled. Seconds later, a huge oak tree fell on top of the house, landing on top of Steve and pinning Sweet inside for hours. Sweet says her husband laid in her lap, the tree on top of his abdomen. “I told him 'Hold on! Hold on! I’m calling for help now,'” she said while choking back tears. Sweet immediately called her dad for help because emergency crews were standing down during the height of the storm. Her dad, Louis Livings, lives just blocks away but by the time he arrived, 44-year-old Steve was dead. Sweet says the monstrous hurricane stole the love of her life. "Steve was one of a kind. He loved to help everyone," she said through sobs. Steve was a manager at the nearby Plattner Automotive Group in Quincy, Florida.